At 34 and struggling to break into the Hampshire side, last summer was one in which Will Smith’s thoughts inevitably turned towards what might be next. There was no obvious resolution until Durham came calling. The county he considers home, where for seven years he played a central part in one of most remarkable stories in the English game. Captain, 2008 player of the year, starring alongside the likes of Shiv Chanderpaul, Steve Harmison and Dale Benkenstein. He returns to a club that have endured a brutal two years but has been thrilled to find so much still to be proud of. “I’ve never been as excited for a season as I am now, and I think this will be my 19th,” he said. “It’s different but it is the same. So much is exactly the same, which is what makes it great. “The people, the staff, the community, the fabric of the club is the same which will stand it in good stead. “The identity of the club, it is that North Eastern pride, that was here during my first time here and it is now. “You had world-class players dropping in but youngsters were always getting opportunities. 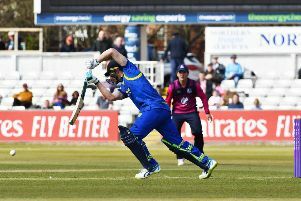 Smith, who is likely to be a key fixture in the top four of the batting order, hopes to emulate Paul Collingwood and produce some of the best form of his career. That pair, aided in the early part of the season by Aiden Markram, will be crucial in holding together a fairly inexperienced line-up. For Smith, that responsibility is something that he will relish. He said: “Last year was quite frustrating, the opportunities weren’t really there for playing. I was Hampshire’s second team captain for most of the year and dabbled a bit in coaching. I had a few options that I was trying to juggle but when the opportunity arose to come here, it went straight to the top of the list. “I had an amazing seven years here that I got a lot of joy and satisfaction from. “The club gave so much to me, so to come back and try and play a small part in putting it back where it belongs, that gives me so much desire. “It is having that purpose to what you do, a challenge at a place I have a huge affinity to, it is perfect. “Last summer it was, ‘what might I be doing?’ I scored a lot of runs and felt a real fluency, even if it was at second team level. “The year before was my best ever year numerically in the Championship, I scored a double-hundred against Lancashire so I feel as if my game is on an upward curve really. “I’m one of the older guys in the dressing room but in terms of fitness and enthusiasm, I still feel pretty young. “When I was younger you look to guys in their thirties and think, ‘they’re old’, but now I’m there I don’t really feel that at all.